Staining of Bovine peripheral blood lymphocytes with Mouse anti Bovine CD44 (MCA2433). 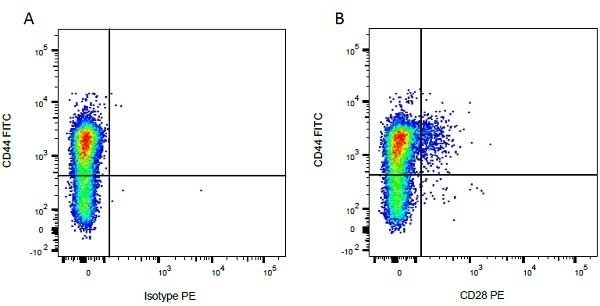 Mouse anti Bovine CD44 antibody, clone IL-A118 recognizes bocine Phagocytic Glycoprotein-1 (PGP-1), also known as CD44, Hermes antigen, Extracellular matrix receptor III or HUTCH-1. Bovine CD44 is a 346 amino acid ~90 kDa type I single pass transmembrane glycoprotein containing a single Link domain, responsible for hyaluronan binding. 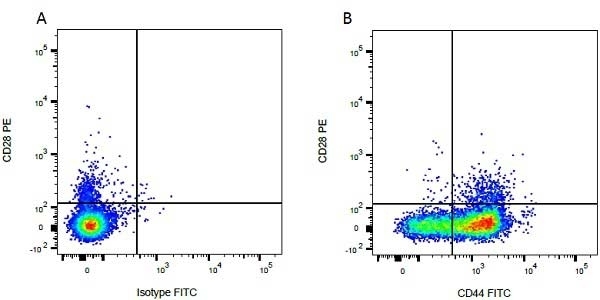 Bovine CD44 is expressed by a wide range of bovine cells, including peripheral T and B lymphocytes, monocytes, granulocytes, platelets and early erythroid cells. Spleen cells from immunised BALB/c mice were fused with cells of the X63.Ag8.853 myeloma cell line. Naessens, J. & Nthale, J. (1993) Biochemical characterization of three non-lineage antigens defined by workshop antibodies. Vet Immunol Immunopathol. 39 (1-3): 217-23. Menge C et al. (2004) Bovine ileal intraepithelial lymphocytes represent target cells for Shiga toxin 1 from Escherichia coli. Infect Immun. 72 (4): 1896-905. Cell Biol Int. 40 (12): 1332-9.
de Moraes, C.N. et al. (2017) Shotgun proteomic analysis of the secretome of bovine endometrial mesenchymal progenitor/stem cells challenged or not with bacterial lipopolysaccharide.